Have you finished your sightseeing activity? Red Sea snorkeling and diving? Do you think in doing something different? 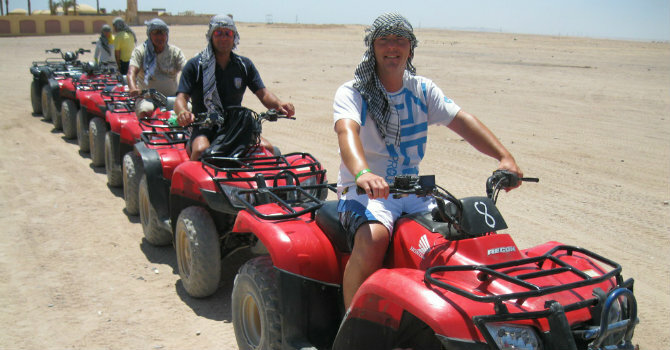 Her is the answer, take your family in quad runner experience for the extreme adventure in the Egyptian desert. It will be the sign of your memorable vacation time in Marsa Alam. We will pick you up from the hotel then transfer to the quad bikes station to get that important short safety presentation and test drive before the fun starts. Start driving for 25 km by motorbike and arrive to the near Bedouin village, we will stop there to learn about their customs and life style, you may also savor the Bedouin tea and smoke water pipe then drive back to the station and transfer to your hotel.